One would not have thought that “fragment” and “porcelain” could co-exist as happily as they do in this teapot, from Marek Cecula’s “Fragment Series”. Why fragment? Cecula (born Poland, 1944, working in New York) writes that, in creating the “Fragment Series”, he wanted to “substitute conventional functionality into a utilitarian sculpture.” In this sense, the notion of fragment lies in enabling the viewer to “experience new visual situations by reassembling or recomposing sections of the form.” It is an essential part of Cecula’s work that the viewers engage with the object, and with the artist. With its sharp, angular handle and spout, and its large spherical body, the teapot is certainly sculptural. Cecula’s reliance on geometric shapes and bold colors in this oversized teapot, recall the design principles of the Bauhaus, which favored simplicity and economy of form and material. When reassembling and recomposing the sections of the teapot, as encouraged to do so by Cecula, one can see Peter Keler’s 1922 cradle, or Marianne Brandt’s iconic silver teapot, with its spherical shape and semi-circular handle. In making the teapot oversized, Cecula might also have been considering a lesser-known facet of the Bauhaus: that of the irreverent and entertaining, captured perfectly in Oskar Schlemmer’s balloon- looking characters for his Triadic Ballet. Catherine Powell is a candidate in the MA in History of Design and Curatorial Studies offered jointly by the Parsons School of Design and the Cooper Hewitt, Smithsonian Design Museum. She is a Fellow in the Museum’s Product Design and Decorative Arts curatorial department. Nice and educative article! Good job! 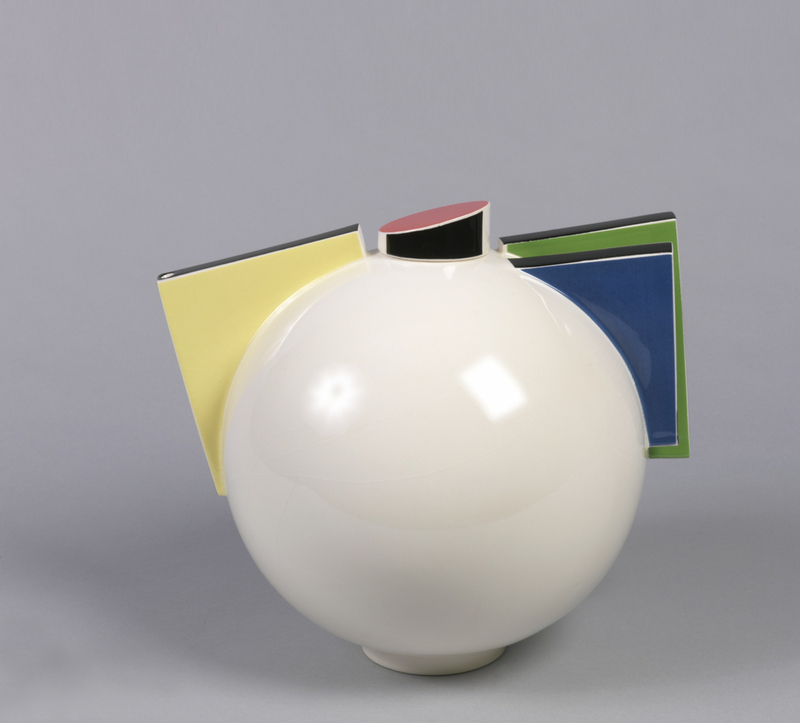 Bauhaus Memory Teapot, 1991. Designed by Marek Cecula. Glazed porcelain, decal. Museum purchase from General Acquisition Endowment. 1991-106-1-a,b.